Baby teething symptoms can begin as early as a few months old. For new and seasoned parents alike, baby teething can be a challenging phase, as most babies experience discomfort associated with their teeth breaking through their gums. Most babies will have their first tooth pop through between four and seven months old, although it can take up to a year for others. 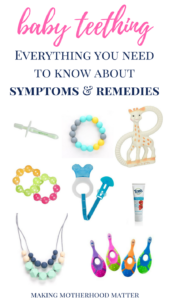 Here, parents will find everything they need to know about baby teething symptoms and remedies. It can be disconcerting as a parent, when you are not sure what is happening to your baby. Baby teething symptoms typically present three to five days before the tooth breaks through the surface of the gums. This is a useful timeline for when parents can expect to see symptoms of baby teething. Below, are the most common baby teething symptoms. Teething babies are notorious for having excess spit up when teething. Bibs, burp clothes and blankets are highly recommended. When my little ones start to teeth, I like to put a foam mat on my floor to protect the carpet and because they are easy to wipe clean. A common baby teething symptom is for a baby to run a low-grade fever, typically below 100 degrees. If everything starts going into your baby’s mouth, this is a symptom of teething. They may want to bite on anything they can get in their mouths to relieve the pressure in their gums. You may notice them continually sticking their hands and fingers in their mouth. Read below for baby teething remedies. Teething babies can become fussy or easy irritable as a result of the pain brought on from teething. Babies can often develop rosy cheeks when they are teething. Sometimes their cheeks can even feel warm to the touch. 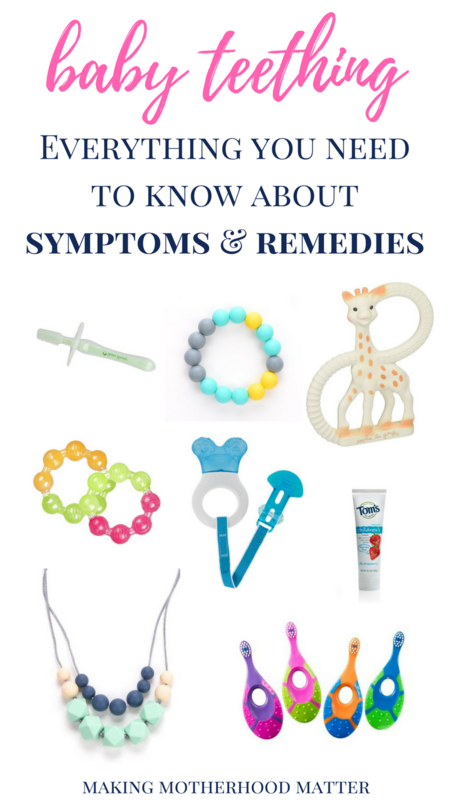 Diaper rash and loose stool are highly debated baby teething symptoms. Although medical professionals cannot find a direct correlation between the two, if you ask any group of moms what their experience has been with teething babies, they will confirm the two are certainly related. Changing diapers promptly after the baby has a bowl movement and often is one way to prevent the diaper rash from spreading. Babies may pull or rub their ears as a symptom of teething. If you find your baby waking early from a nap or in the middle of the night, this may be a symptom of teething. Some babies have difficulty sleeping through the discomfort caused from teething. Some babies will experience a slight decrease in appetite because of teething. Drool is a common baby teething symptom caused by the swelling in the gums. As a parent, you will want to monitor which symptoms and the pain level your baby is experiencing. Each baby is different and may experience a variety of the common teething symptoms above. Some of the baby teething symptoms can also be symptoms of more serious issues, so please check with your baby’s health care provider regarding any concerns. Here are some baby teething remedies to help manage your baby’s discomfort. With clean hands, parents can gently rub the baby’s gums to provide relief. Teething toys can provide great relief to babies. I especially like the ones that can be refrigerated or frozen like this or this. Or the silicone gum massager like this or this. Parents can give babies teething crackers like this. Parents can wear a multi-texture teething necklace for the baby to chew on like this or the baby can wear a silicone teething bracelet like this. After checking with your health care physician, parents can give acetaminophen or ibuprofen (make sure the label says for infants) to help relieve your baby’s discomfort. Parents can request a dosage chart from your health care physician as well as reading the product label. Parents can help to keep baby teeth healthy by brushing them every day with an infant toothbrush and infant toothpaste. Here is a quick overview of common baby teething symptoms & remedies. What have you found helpful for relieving baby teething pain? 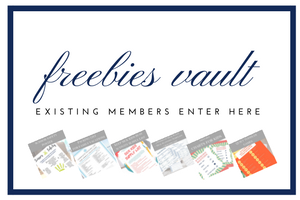 Psst… Would you like to connect with a network of parents in the same phase of life who can answer questions you might have about milestones like teething? Click the link to join Balanced Mommies Group, a community for moms to get connected today. P.S. If you enjoyed this post, you may also like 6-Month-Old Baby Feeding + Sleeping Exclusive Sample Schedule or Survival Guide for the Sleep Deprived Parent: 7 Strategies to Help Your Baby Sleep Through the Night.